Perhaps you are not a huge squirrel fan and don’t want these sly bandits gobbling down all your bird seed or scaring off your beautiful menagerie of feathered friends. If this is the case, then there are a few solutions to discouraging squirrels from feasting at the wrong table. 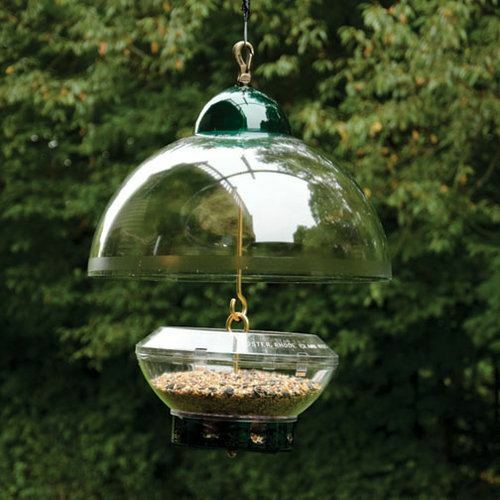 Here are 5 ways to squirrel proof a bird feeder. What is a squirrel baffle? They are a device usually cylindrical or dome shaped that are used to deter squirrels and other small mammals from getting to a birdfeeder. They vary in design as some will have rotating cylinders to shake the surface, throwing the squirrel off. Other designs can include a sloped disk or tapered cones. They can be made of metal or plastic to create a slippery surface. If your birdfeeder has a roof, the roof can be altered to act as a baffle. You will have to work with it, and adjust the positioning to really keep those critters out. Another solution to deterring hungry squirrels is to fill your bird feeder with food bits the squirrel doesn’t want. While safflower may attract bird species like cardinals and chickadees, squirrels balk away from it quickly. If you are attracting goldfinches and similar others of this kind, nyjer thistle will work as a squirrels do not like thistle. Finally you could select a birdseed mixture with a large amount of white millet seed, this will due for house finches and mourning doves, but not for furry little critters. Many people suggest using a hot pepper powder like cayenne. While this won’t bother the birds, and squirrels won’t come back again, it may hurt the squirrels’ mouths if they do ingest it. Always try other ways before resorting to this. Squirrels are problem solvers and they fly at distances of around 5 or 6 feet from point to point. The typical rule when placing a bird feeder anywhere is to follow the 5-7-9 rule. Which means a feeder should be placed at least five feet off the ground, seven feet away from anything that could be used as a launch pad, and nine feet below branches. There is an abundance of bird feeders available to buy which focus on outsmarting these sly creatures. Some of the best ones have a cage protecting the feeder from the squirrels, yet still allowing small birds to get inside to feed. There are some bird feeders with savvy new designs which use counterbalance baffles that will close the feeder’s opening when a heavier animal than a bird comes to feed. Research has found out that squirrels are very territorial. If they have a dedicated squirrel feeder with their favorite treats like raw whole peanuts, sunflower seeds or corn, they will mark this feeder as their own. This also helps to keep out any new squirrels. Throw these favorite foods into a hanging platform feeder (platform feeders give them plenty of room to sit!) or a specialized squirrel feeder. The last option is to purchase a squirrel proof Wild Bird Seed. The "heat" from the chili pepper seems to work really well. In some cases, the squirrels will visit the feeding site a second or third time before they get the message. Only then will they seek food elsewhere. Squirrels will continue to check known sources of food, but will eventually go away once they perceive the presence of "heat" from visual and/or aromatic queues. Remember in your valiant effort to keep squirrels away, not to cause harm through careless methods. These energetic little animals are only trying to find a food source, and sometimes this can become a scarce hunt, especially during winter season. If you can provide a separate area for squirrels with their own food, this is preferred and is truly a way to connect to nature in its fullest splendor.